The Jazz Club slot from Playtech uses a great minimalist style to deliver a great title that is light on the showiness but heavy on the character. There’s a strong feel to this game that derives from its unique, ‘30s inspired art style, and the great jazz sound effects that aren’t so intrusive that they get irritating. In terms of specifics, the title uses five reels and three rows to comprise its gameboard. Whilst it only offers a single additional feature, it’s a mixture of two classic slot machine bonus rounds and it can yield extremely high returns. Visually very strong. The simplistic styling of the game board contrasts well with the eclectic artwork used for the symbols. This makes for a title that well-suits the tempo and feel of jazz music. Great bonus stage. The Jazz Club’s bonus round merges both a “pick a box” style feature with a traditional free spin plus multiplier stage. This is not just an exciting side game to play but is also a potentially lucrative one. Ideal for high rollers. There are very few machines that offer above £2,000 per spin at most online casinos. The Jazz Club’s £2,500 maximum bet will be music to the ears of those wanting to splash some serious cash. Excludes lower limit players. There are many players out there who will want to use all 25 win lines but find the minimum £5 bet too much for their bankrolls. Most players want to play more than a few spins on a machine before going bust, and The Jazz Club will probably price a large portion of these out. Horn player = 5,000x the line bet. Bass or keys = 1,000x the line bet. Whiskey or treble clef = 500x the line bet. 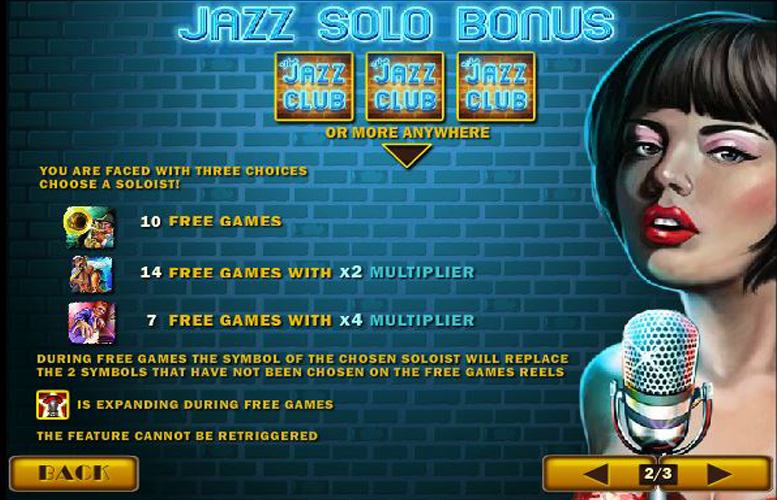 Whilst there is just one game feature on The Jazz Club virtual slot, it happens to be an excellent one. It blends two classic slot bonus features together for a game that’s not only fun but capable of dropping some hefty cash prizes. 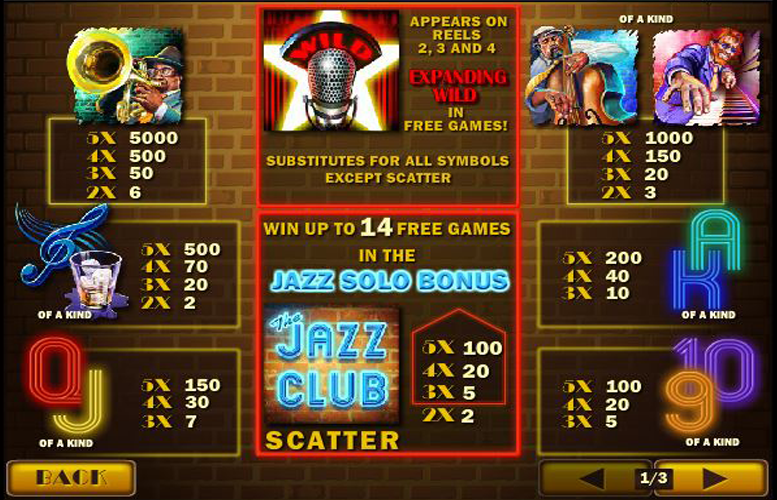 Landing three or more game logo “scatter” symbols anywhere on the win lines will trigger the “Jazz Solo Bonus”. Players are given a choice of symbols. If they select the trumpet player, they receive a standard 10 free games. Choosing the bassist will trigger 14 free games with a 2x multiplier. Finally, the keyboard player is worth seven free games with a 4x multiplier. During these free games, the symbol of the chosen soloist will replace the other two musician symbols on the free games reels. In addition, the microphone “wild” symbol is expanding during all free games – giving even more chances to win big. Ace or King = 200x the line bet. Queen or Jack = 150x the line bet. 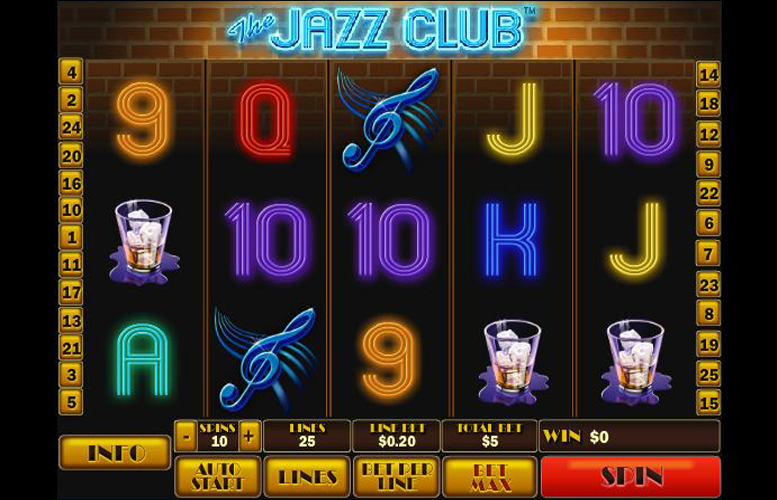 Players can vary the number of win lines they bet on, and the amount bet per line on The Jazz Club slot machine. They can choose between one and 25 win lines, and between 20p and £100 to bet on each. 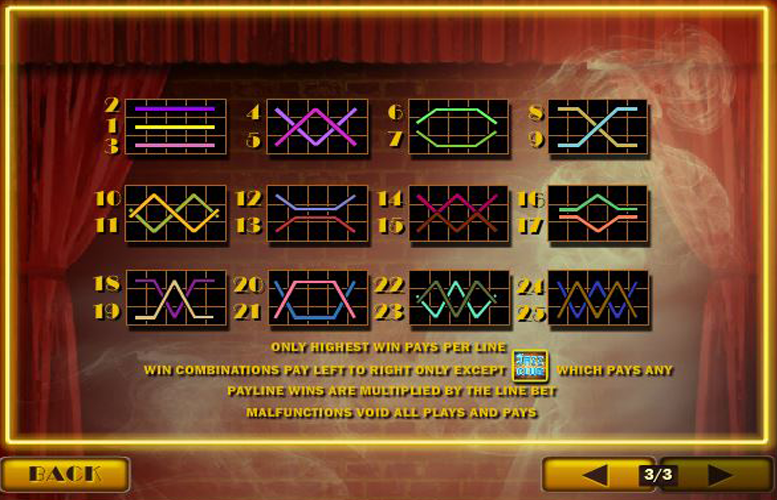 This is somewhat different to many slot machines out there, as the minimum bet using all possible win lines is £5 per spin. Players can of course reduce the number of lines they play down to just one. This would make the cost per spin just 20p. Meanwhile, at the other end of the spectrum, players electing the use the maximum possible variables can expect to pay £2,500 dollars per spin. Clearly, The Jazz Club slot machine caters for a higher rolling crowd than many of its peers. It also does this whilst excluding the very lowest limit players. It’s common knowledge that the maximum return to player rating is only achieved using the maximum win lines on a machine, and the £5 minimum bet using all 25 lines on The Jazz Club this will price many out. Despite not catering the lower limit players, the Jazz Club slot machine is a great example of how less can be more on a slot machine. It uses a minimalist background that contrasts well with the fantastic, brush-stroke art style of the higher value symbols. It might only offer one bonus stage but it’s good enough to negate the lack of variety. All told, if you’re looking for a machine with a high top limit, and a great feel, The Jazz Club slot machine might be just the one for you.